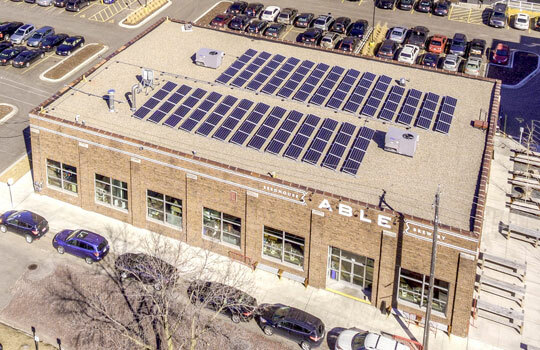 IPS Solar installed this 33.04kW Photovoltaic solar electric energy system in Minneapolis, Minnesota to offset the electricity load of Able Brewery & Seedhouse. The solar array will produce roughly 25% of the brewery’s power; this is one of the first breweries in the state to adopt solar. The panels will produce roughly 35,000 kWh per year, enough to power four average Minnesota homes. Over 30 years the solar panel system will offset nearly 1,500,000 pounds of CO2, the equivalent of adding nearly 3,000 trees to our forests. The system is highly flexible, allowing installs around HVAC units, so space is not wasted. IPS expects at least 30-40 years of useful life out of the system.